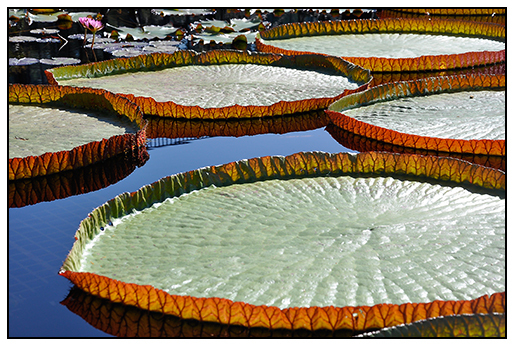 THE VICTORIA WATER LILIES AT LONGWOOD GARDENS, ARE WORTH THE VISIT, ALONE. 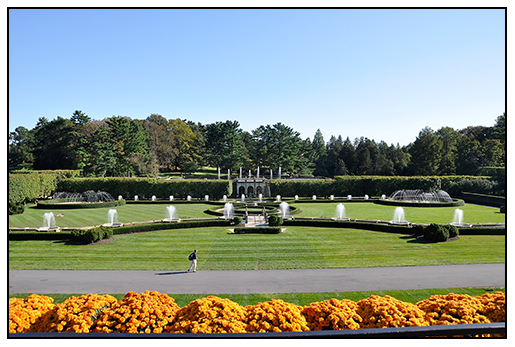 Longwood Gardens is best known as one of the great gardens of the world. Formerly the summer home of Pierre S. DuPont, the 1077 acre estate is open to the public year round. 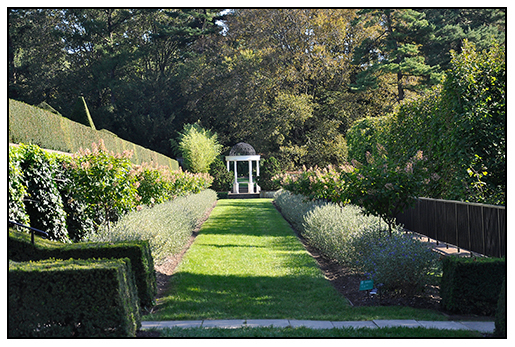 Located in Kennett Square, PA, visiting the gardens has been on my bucket list ever since I was about ten years old ( when I would look at the many iconic photos of the garden featured in a Time Life Book on gardening). 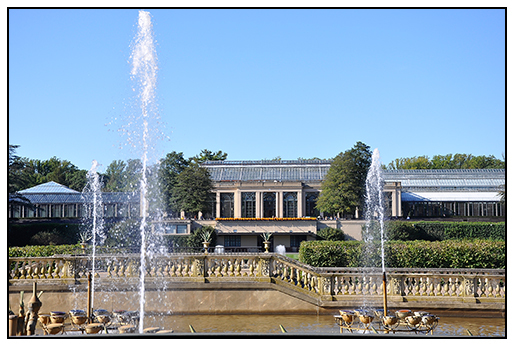 Now, as an adult, my visit was less monumental, as I expected it to be – the victim of over-exposure, knowledge, or perhaps simply age – the gardens and greenhouses we’re like many things experienced as an adult – a little under-stimulating. The vista’s and mature plant material particularly the trees, were impressive, what I am talking about are is the general experience – ( common plants that my ten-year-old mind would have been excited to see, but now are less exciting) – frankly, it just probably takes much more to get me excited, today. NEARLY 6 FEET IN DIAMETER, THESE PADS ARE LARGEST, IN SEPTEMBER AND OCTOBER. 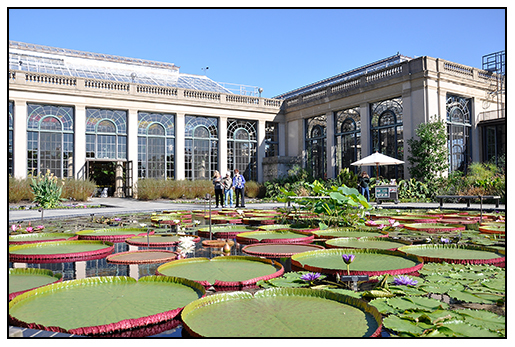 That said, I did enter the gates at Longwood with low expectations, but left inspired and pleasantly surprised with the grandeur that beautiful architecture and vintage glass houses with mature plants can deliver. I was most impressed with the water lilies ( another post to come), the outdoor bedding plant displays ( large swaths of multiples, with perhaps a hundred plants of one variety in borders that must have been 500 feet long), and mostly, with the old, horticulturalness of the turn-of-the-century greenhouses. 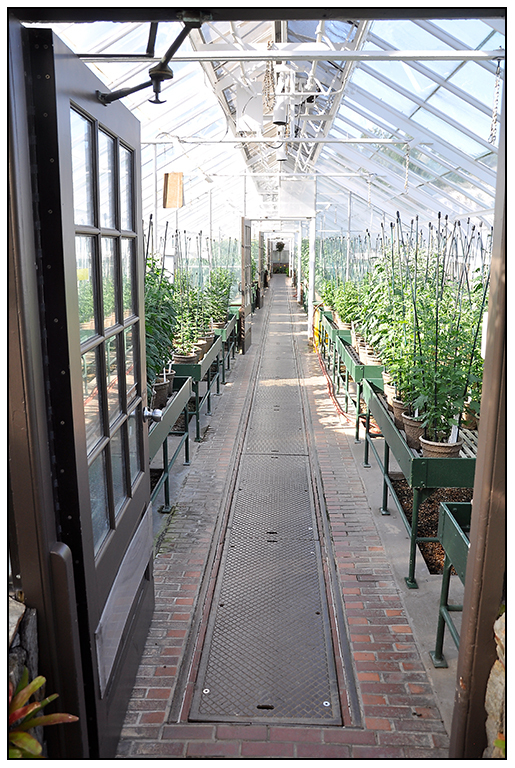 CHRYSANTHEMUMS BEING TRAINED IN A WORKING GREENHOUSES BEHIND THE SCENES AT LONGWOOD. MORE ON THIS IN MY NEXT POST. The classic, glass and wood greenhouses at Longwood are magnificent. Others may like the conservatories and formal plantings, but I like the behind-the-scenes areas best. I can’t think of another word, but maybe gestalt is best – whitewash, old glass, steel and wood, ancient clay pots – it’s why poly hoop houses are just not the same as a steam-pipe, hot water heated glasshouse with cut flower crops growing under the bright sunshine – it’s all part of why many us choose to keep a glass house. I venture to say that the working greenhouses at Longwood are the best part of the visit. 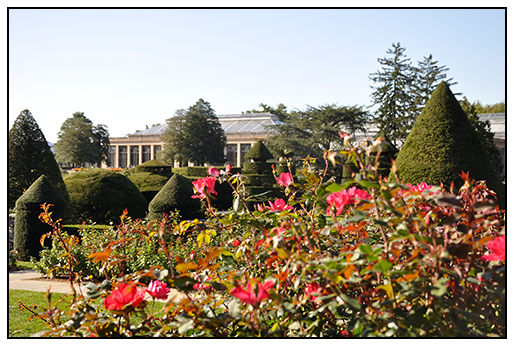 Most views at Longwood are iconic, familiar to any gardener who has read a magazine or book about American Horticulture. Still, visiting any destination in person, is far more impressive that any image can capture. 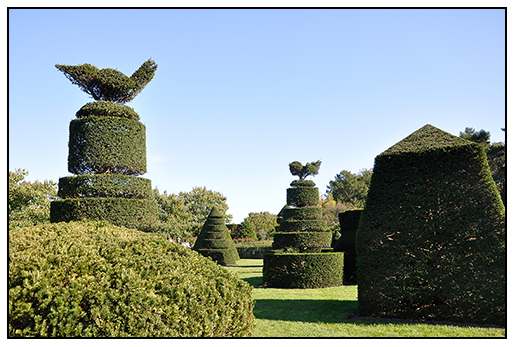 Hundred year old Yews ( Taxus sp) in the topiary garden are nearly twenty feet tall, and a favorite of visitors to the gardens. 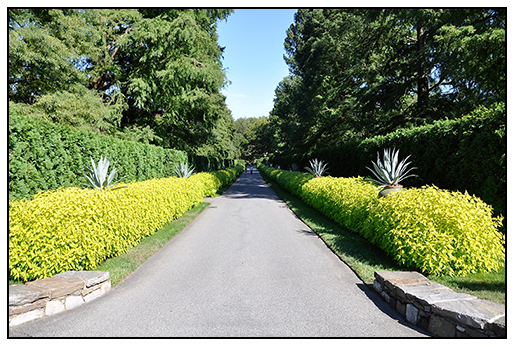 THE 600 FOOT LONG FLOWER GARDEN DRIVE, IS AN AVENUE LINED WITH 27 BALD CYPRESS TREES, AND THIS AUTUMN, PLANTED WITH THOUSANDS OF 5 FOOT TALL PLANTS OF GOLDEN PINEAPPLE SAGE. 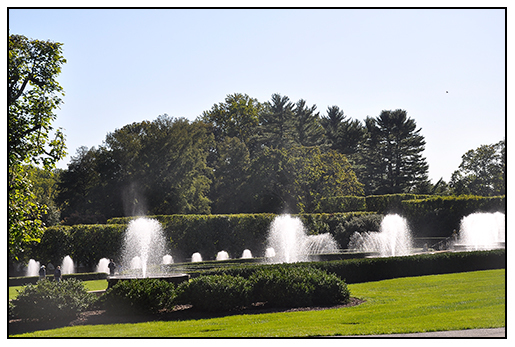 MOST PEOPLE VISIT THE GARDENS FOR THE FOUNTAINS, HERE, THE MAIN FOUNTAIN GARDEN DURING THE DAY SHOWS THE PASSION FOR FRENCH ARCHITECTURE THAT PIERRE S.DuPONT HAD WHEN HE DEVELOPED THIS PART OF THE GARDEN in 1928. THE CARYOPTERIS ALLEE, AN ICONIC AND FAMILIAR VISTA, FOR ANY GARDENER WHO HAS READ A GARDENING MAGAZINE OR BOOK, LOOKS GREAT, EVEN IN AUTUMN WHEN THE PURPLE SHRUBS ARE NOT IN BLOOM. 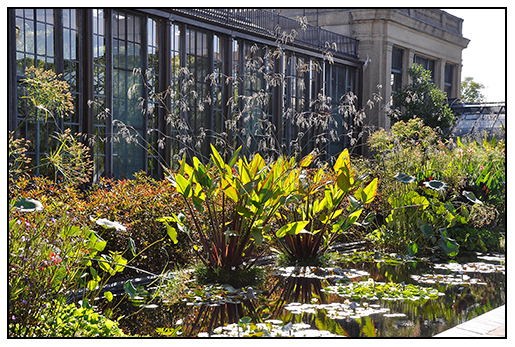 Outside of the conservatory, the water lily garden is most impressive.